As a child I had a love affair with 5th Avenue. I thought it was the grandest place I had ever seen! I still love it and enjoy painting it. This is 5th Avenue down around 34th Street which I came to know well since my first job after college was right there at 34th and 5th. 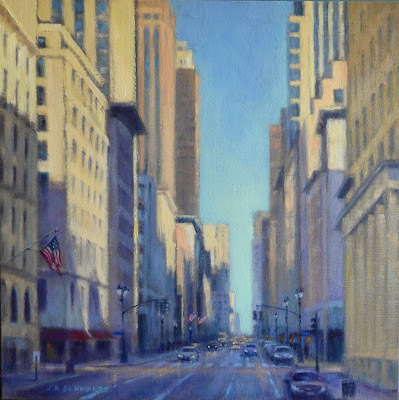 I think what makes NYC unique to paint is the canyon like effect of the extraordinarily tall buildings and the fact that it is built on a grid. There are very few diagonals and virtually all streets are east, west, north and south. Easy to choose the light source. Opening reception September 21st from 6:30 until 9:00 PM,I will have two paintings in this show, "Yellow Sky" and "Key Bridge Nocturne". Please go towww.principlegallery.com for more information. With luck the above painting will be include in the auction.